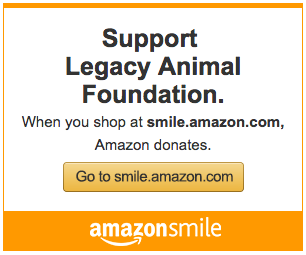 Legacy Animal Foundation provides hope for animals in need of care. Many people and organizations offer a caring hand, give countless hours and provide sacrificially to animals in need. And yet, it is often not enough. Legacy Animal Foundation strives to save the lives of animals by providing grants to qualifying shelters, rescue organizations and pet owners to help with the high cost of medical treatments. Have obtained a diagnosis, prognosis and treatment plan. Legacy Animal Foundation cannot pay for office exams or diagnostic testing. Make a concerted fundraising effort, attempting to find funding through your own means and personal contacts. Schedule the appointment for the procedure to be performed on the animal within one (1) week of veterinarian receiving funds. Provide updates, photos and video if Legacy Animal Foundation is able to help. Have a debilitating injury or illness that requires specific treatment. Be willing to speak with a representative from Legacy Animal Foundation and provide an itemized estimate upon request. Accept a check from Legacy Animal Foundation. Legacy Animal Foundation is not a shelter or veterinary clinic. We cannot accept or shelter animals. For assistance, contact your local Texas animal shelter.